Dimensions: 6 3/4 x 11 1/4 in. *Title: As is the case with his florals, still lifes, portraits, and other figure studies, Fiene did not typically give titles to his nudes, though there are exceptions, such as "Asleep" and "Bather". **Medium, Paper and Color: The one observed impression (25/30) of this work is printed in brown ink on japan paper. Monochrome prints, even when the single ink is other than black, are not considered to be color prints for the puposes of this catalogue raisonné. ***Printer: Even though no direct evidence is currently available to substantiate that George C. Miller was the printer of this lithograph, it can be inferred. Miller is the only printer known to print Fiene lithographs in New York (or for that matter in the United States), and at least from as early as 1926. 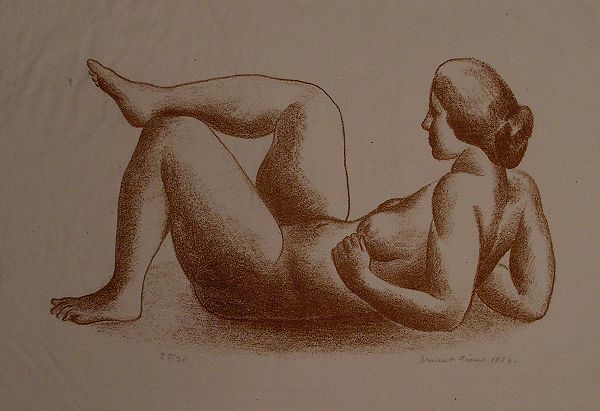 Two impressions of lithographs from 1926 dedicated to Miller have been observed. (See Barns and Winter.) Throughout Fiene's career of making lithographs in New York, he typically dedicated an impression from outside each edition to this printer.